Professional installation outcomes. Large remodeling jobs or smaller tasks. Finish your ceiling and wall repairs. Knowledgeable and qualified job crew. No-pressure quotes. Work around your schedule. Great results are guaranteed. Would you like to have some new interior walls and ceiling put up at your home or business? Or it could be you want to get a couple of holes in your walls fixed. They specialize in setting up and fixing ceilings and interior walls. If you have an area which needs fixing, they are able to do that. Yet they also work with new construction too. 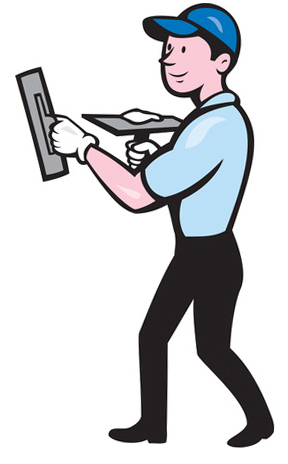 They will perform minor repairs which happen due to a mishap, or larger repairs which are due to fire or water damage. They work with homeowners who are working on renovating projects. They can also complete new building construction jobs for contractors. 1. Bringing the gypsum drywall sheets to the job location. 3. Cleanup and taking away project trash and unused material. 4. Taping the seams and joints and applying joint compound. The painting process can begin once the fifth step is finished. They are able to undertake each of these steps for your job. Or they could do just some of them. For example, if you’d like to handle your own taping and mudding, they can just deliver it and put it up on your walls so that you can finish off later on. Sometimes they are called out to projects where the sheetrock is already up on the walls, so they just have to do the seam taping and sanding and finishing aspects of the job. And they can mount specialty moisture proof fiberglass-based boards in damp areas, or backer board solutions like cement board on walls where you wish to install tile. 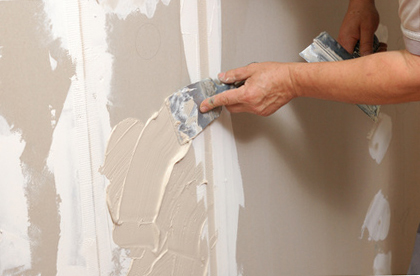 Sheetrock gets damaged by incidents and by plumbing problems on a regular basis. It is quite common for a ceiling or wall to get a hole or get damaged by a dripping water line. If your property has just a single hole, and that hole is in a place where most people will never see it, you should try and fix it on your own by installing a patch. Putting on a repair patch is an easy technique, but a person frequently needs to do it several times before they get good at doing it. Don’t be surprised if your initial attempt doesn’t end up flawless. A hole or dent in a really visible location should most likely be taken care of by somebody who has experience doing those types of patch repairs. One of the more challenging aspects of the project is getting the new or repaired materials to match the surface texture of the existing materials once it is done and painted. Repairing or patching one or more individual holes or seam splits. Correcting a few panels so some areas or rooms can be repainted. Getting rid of and replacing sheets of drywall damaged by water. Doing the removal and replacement of a whole area. Commonly because of a water disaster or other event. They can correct your small-sized affected areas, or they can carry out a complete remodel. They can get the job done. The decision is yours regarding the final texture of your repaired ceiling or wall. Fully unfinished – only taped, designed for unfinished work or storage places or garages. Smooth finish – zero extra texture, all set for paint or wallpaper. Basic texture – contributes some extra depth. Complex texture – requires additional troweling and more difficult to do. Texture match – your replacement materials match your original ones. Does your ceiling have popcorn ceiling texture? They can take it off and change it with a different, modern finish. They are an experienced local Eastvale company that performs interior ceiling and wall renovation projects. They try to deliver top-quality projects at a sensible cost that most homeowners can afford. They work with the top manufacturers, so the products they install at your property will be strong and durable. Their team is dependable, neat and considerate of your property. They attempt to shield your belongings from dust and harm. They try to leave your house exactly like how they first found it. When they are finished, they haul away all the garbage and scrap materials. The majority of jobs are completed in older homes, but they also work for building contractors in new building too. They can work for contractors, landlords and individual homeowners. They will be very happy to speak with you if you call. Many people like to get an estimate. They can do that for you. Your cost will mostly depend on the size and extent of the work. While they can be very similar, most individual situations are relatively unique. The ideal way to provide a estimate is to actually look at the upcoming project site, however if you can call them, they should be able to go over the facts over the phone. Once It’s Finished, Who is Going to Paint It? In case you don’t want to paint it by yourself, they can typically tackle that phase of the job too. You can also have a different painter to get your new or repaired walls and ceiling painted, or you might do it yourself. Whatever you want to do is fine. They work at homes and businesses in many parts of town, often near Eastvale CA, Glen Avon CA, Mira Loma CA, Pedley CA and other neighborhoods east of Fontana. They work at homes and businesses in many parts of town, often near Eastvale, Glen Avon, Mira Loma, Pedley and other neighborhoods east of Fontana.